Habit at Paia, Maui, Hawaii (USA). March 30, 2001. Origin and Habitat: Southern Japan, central China, Taiwan and several islands in the South China Sea. Habitat: Coastal forests, often on sandy soil at low elevations. Ecology: This species is pollinated by wind and a variety of insects and animals such as beetles, bees, flies, ants, and bats. 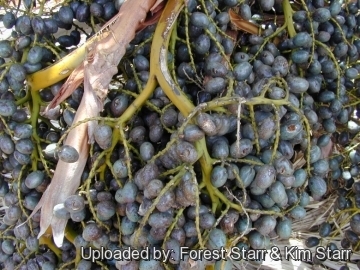 The seeds of Livistona chinensis spread by gravity. It may be possible that plants also spread in water and, nowadays, primarily by humans using the plants in landscaping. This plant can become a weed, or in some ecosystems an invasive species - such as in Florida wetlands and on some Caribbean Islands. Livistona chinensis subs. subglobosa (Hassk.) Becc. 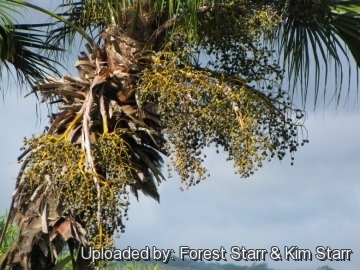 Description: Livistona chinensis is a versatile and inexpensive hardy species widely used as ornamental in tropical and temperate areas. The divided leaves have long, tapering, ribbon-like segments which gracefully sway beneath the leaves, creating an overall fountain-like effect. Although usually seen as a low growing, shrubby tree, it can grow quite tall. 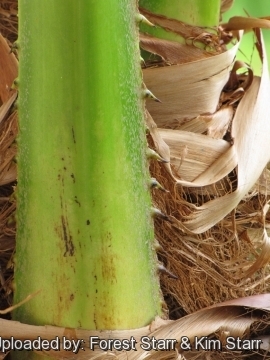 Trunk: Solitary, straight, brown with non-persistent leaf base, usually about 4,5-9 m tall in cultivation, but up to to 15 m or more tall in its native habitat, up to 30(-45) cm in diameter and wider at the base. 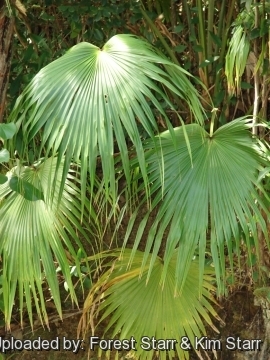 Crown: It forms a dense canopy with numerous fronds, spread 3-3.7 m. No crownshaft. Leaves: Coatapalmate, p to 1,8 m in diameter, pale to bright green, fan-shaped, divided to approximately half way into about 75-90 ribonlike segments that droop downward to give a gracefully fountain-like appearance. Only a slight breeze is needed to move leaf segments adding a fine textured effect. Segment tips deeply bifid. Margin entire. Petioles armed with stout prickles. each 2-3 times divided into rachillae, bracts brown tomentose. hidden within the crown. Flowers inconspicuous, pale yellow-white. Fruit: Oval, round or pyriform, about 1,5-2,6 cm long, 0,9-1,8. There is a single seed inside each fruit. cm in diameter.2 cm wide, bright green that turn dark blue to blue-grey when ripe that hang in dense clusters. Remarks: A dwarf variety (Livistona chinensis var. subglobosa) is available and particularly used as an indoor plant. 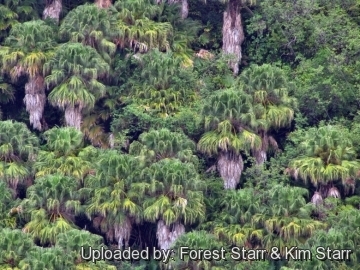 1) Forest & Kim Starr Livistona chinensis (Chinese fan palm). Plants of Hawaii. <http://www.starrenvironmental.com>. Downloaded on 21 August 2014. 5) Barfod, A.S. & Dransfield, J. (2013). “Flora of Thailand” 11(3): 323-498. The Forest Herbarium, National Park, Wildlife and Plant Conservation Department, Bangkok. 11) Govaerts, R. & Dransfield, J. “World Checklist of Palms”. The Board of Trustees of the Royal Botanic Gardens, Kew. 2005. Cultivation and Propagation: It is cultivated in tropical, subtropical and temperate regions and planted in gardens and parks. If you needs a low maintenance, but graceful looking palm, it doesn't get any better than Livistona chinensis. It's usually seen in clumps and tolerating neglects. Soil: It is suited for fertile, loamy substrates, but it is adaptable to many kinds of well-drained soils, including clay; sand; alkaline or acidic. Fertilization: Need a perfect fertilizer diet including all micro nutrients and trace elements or slow release fertilizer applied during the growing season, or according to package directions, using a fertilizer specifically formulated for palms. Water Requirements: It tolerates low levels of humidity, though it prefers evenly moist but not consistently wet medium. Plants should be watered during dry spells and will benefit from an organic mulch. When supplied with adequate moisture and fertilizer it is also fairly fast growing. 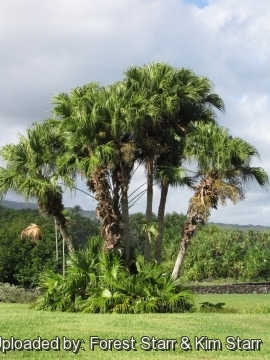 This palm forms a long tap root and can survive extended periods of drought once established. It dislikes soggy soils. Light: It prefers bright sunny locations, but it also does well in part shade with some direct sunlight, young specimens should be partially shaded. It will also survive in rather heavy shade but "stretches" to lose its compact shape. It produces flowers and fruit only in sunny positions. Hardiness: It is a hardy species surviving in tropical and temperate climates, though growth may be slower in temperate areas. 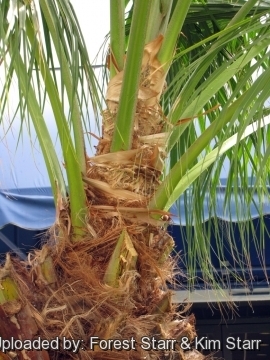 ( ZONES: (9A),9B, 10A, 10B, 11, This palm may also be hardier Zone 8 and survives routinely winter temperature down to -10° C with no ill effect, but it may survive temperatures as low as -15° C degrees which burns the leaves but the plant recovers readily. Roots: Usually not a problem. 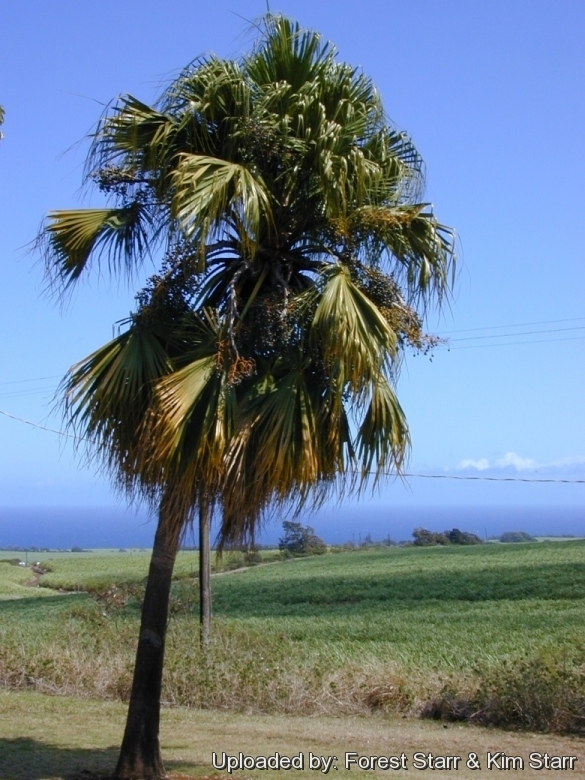 Maintenance: The palm is self-cleaning of old leaves and will require little or no pruning. Pest and diseases: It is fairly vulnerable to lethal yellowing disease. Uses: It is used massively in gardening and landscaping in many parts of the world though in sheltered areas it will survive periods below freezing point. Its neat form makes it ideal for staggered groupings, street without pavement, parking lot island, sidewalk cutout (tree pit), highway median, tree lawn or used as a free-standing specimen. They form a closed canopy when planted about 3 m apart along a walk or street. They grow well in confined soil spaces and can thrive in harsh urban conditions. It is also excellent in containers and urns. It also tolerates shady spots and it is a good indoor container plant often seen inshopping malls, especially when young. Propagation: Fresh seeds if kept warm germinate readily within 1 to 4 months of sowing.